Belladerm MedSpa offers gift cards so you can share our skin care products and services with your friends and family. You can’t go wrong with a trip to the spa for a relaxing facial. If you or your loved ones have an upcoming birthday, holiday, anniversary, engagement, or other occasion, make the day even more special with a gift card to Belladerm. *This card represents a pre-payment for goods and services. The gift card must be presented at the time of redemption and is not valid toward the purchase of another gift card. 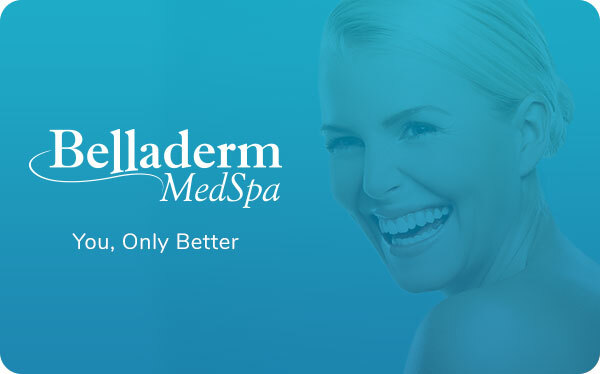 Belladerm MedSpa gift cards are not redeemable for cash and not applicable to a credit card account. Any resale or transfer of this card will render it void and subject it to cancellation. This card is not replaceable if lost, stolen, or destroyed. All prices are subject to change. Management reserves all rights.